From the Warp: What is 40k to you? What is 40k to you? Back in White Dwarf US Issue #354, there was a Standard Bearer article that had a pie chart in where Jervis broke down what the hobby was to him. Part this, part that and so on until he figured out where it was that he spent most of his time. That's my chart up there. It's changed over the years and even more so over the past year. It wasn't until I went to Games Day this year that I realized that I enjoy the modeling and painting aspect of the hobby more than anything else. Looking back, it's obvious, my moving away from a legal army list to making what I wanted based on what I thought looked cool and fit with the background as I imagined it. Add to that I don't really play anymore (maybe a game a month now) and my commission work on top of that... it's amazing that I get a game a month in really. These days, it's the modeling and painting that I really enjoy. Entering Golden Demon this year really showed me that too. I just enjoy looking at the models and spending time painting and sculpting. Of course it doesn't hurt that my skills have been slowly improving over the past year so that's been a positive reinforcement. And there's lots of "hobby" out there to pull from too, listening to The Independent Characters talk about "hobbying" back in their 9th Episode (Yes, I am behind) got me thinking about all the resources out there. And I'm not talking about gaming, I'm talking about resources for people who just like the modeling and painting aspect of 40k. For the longest time, I always thought that I wouldn't be "into 40k" if I didn't actually play the game. Maybe that's why I've hung on for so long trying to "play." Don't get me wrong, I love to play and face a tough challenge with my army. Heck, my Deathwing record isn't half bad either. But to sit down and just talk about painting or greenstuff work, that's what I really enjoy. Finding a new model or a concept drawing that catches my attention and then building or painting it, that's the most fun for me. I'm fortunate the my clients seem to have the collest projects they want me to do as well, I've been able to build some stuff that I would've never thought of doing on my own over the past year. These days, I'm less worried about "playing" and really starting to look at models that I might enjoy painting or trying to build. Of course I have to squeeze them into all the work I already have, but that's another story. Now that my abilities allow me to build and paint the things I can imagine, or more like change things to what I want them to look like, I'm going back and mining all my old ideas for stuff I can bring to life... regardless of whether or not it's playable. Nice post. I'd have to say, for me, my chart would be almost 50% camaraderie at this point in my life. I enjoy getting out with the guys one or 2 evenings a week and enjoying a game. The gaming group for our area (Dallas/Ft. Worth) is very good ( www.adeptusnorthtexas.com ,for anyone who might care or is new to the area looking for 40K/Fantasy gaming). My subsectio0n of that same group (the guys I play with regularly) is even better as they just make the games fun. We actually discussed this a week or so back, and we all agreed if it wasn't for the people we got to play with (if the area was full of rules lawyers and powergamers) we'd have been long gone. Heck, camaraderie but be 55% for me these days. That leaves 20 - 25% background? Yeah, that'sprobably right on the money. I do enjoy the fiction, just don't read it voraciously as I used to (Probably because I read the books before I actually started playing the game, and I've read just about everything that I was dying to read out of the back catalog. I am looking forward to the final books of the Heresy and the new Ciaphas Cain, of course). So, for me, 50% camaraderie, 20% background, 3% Collecting, 15% modeling and painting and 10% gaming (give or take a point here or there). I've got gaming low because I enjoy the casual social games: the tournaments, not so much. I played Astronomi-con this year in Dallas and I enjoyed it as there was not the impetus placed on power gaming builds and your army comp score and sportsmanship meant quite a bit, that keeps the nut jobs out (although there might have been one or 2 there and I didn't play them, but I doubt it) and makes the tournament itself more of an event rather than just a weekend 40K tourney. 'Ard Boyz I don't ever see me playing at, based on what I've heard from guys who were there, and the BoLS tourney I hear was a bit on the competitive side. I realize there are folks who like that side of it and that's great, I just don't have to pay money to play against them. It'd take a while for me to come up with one myself. And I'd personally split up modeling and painting. Modeling would definitely be the majority as my main passion with miniatures is custom conversions. Would you say that you dislike playing the game, or does leave an ashen taste in your mouth? Meaning it just doesn't really do anything for you when you do play ? 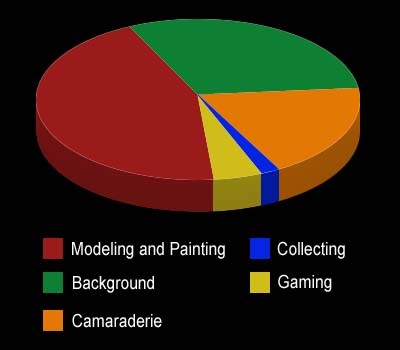 Hmm... hard to quantify percentages, but I'd guess that my chart would be pretty similar to yours with a bit of the modeling/painting given over to gaming. I have no idea how I'd divide things up. I'd really love to play (more), for example, but there's no very close gaming stores and I don't know anyone else locally that's interested in the game. Free time is at a minimum at the moment, too. Is it possible to have hypothetical percentages based on what we'd like to be doing, as opposed to what we have to "settle" for? Heh. Ron's pie chart looks to be very similar to mine. 100% camaraderie with my brother. That's it. Nothing else matters. The modeling and projects we do ourselves are a plus. For me it's about 90% modelling and painting. I run a hobby shop as well and the other 10% is the enjoyment of meeting like minded people. Black Matt: I don't dislike playing, it can be quite a challenge and a fun puzzle for me to try and figure out how to win when I'm outnumbered 8 to 1. That beind said, I just enjoy the modeling and painting aspect and seeing finished models more than I do actually using them. I enjoy most all of it the same. I gots teh books, models, friends who play. I think I'm biggest on the background and fluff though.